Since 1996, Data Masons Software has been providing Electronic Data Interchange solutions to companies that need to electronically share documents and other data with their partners. The company’s EDI Made Simple approach serves up advanced, plug-and-play EDI solutions that integrate seamlessly with multiple enterprise resource planning (ERP) products, enabling customers to connect with partners within hours instead of weeks. The privately held company boasts nearly 100 employees and headquarters in Sarasota, Florida. Data Masons Software has specialized in making Electronic Data Interchange (EDI) simple since 1996. The same, however, could certainly not be said about the company’s existing website. Complicated, outdated and tough to navigate, the existing site underwent a complete overhaul under the direction of the company’s first Director of Marketing Heather Robinson. While traffic and company growth had remained steady with the outmoded site, both could gain even more momentum with a website revamp. Two of Heather’s goals were to be responsive to the growth the company was already experiencing while generating new leads with a site that boosted visitor engagement and conversions through growth-driven design (GDD). Read More: Traditional vs.Growth Driven Design - Which Is Right for You? Turning to HubSpot and LyntonWeb for help with all of the above was a no-brainer, thanks to Heather’s research into the platform and exceptional experience working with the agency in the past. With a track history of success and the ability to rapidly fill a company’s EDI needs since 1996, Data Masons was continuing to grow as a company. What had failed to keep up was its website. Tackling the homepage was one of Heather Robinson’s first orders of business when she was hired on as the company’s first-ever Director of Marketing in mid-2015. “The homepage was very busy,” Heather explained. “It was difficult for a visitor to know where to go.” The homepage revamp eventually led to a complete overhaul of the entire website, as streamlining the site’s appearance and navigation was only a portion of what Data Masons wanted to achieve. Control of the website was another goal, as the existing site was built and maintained by an outside vendor. Changing even a single word had to be done externally, and with a cost. Bringing control of the website in-house would likewise provide access to valuable metrics that went deeper than Google Analytics, another objective. “We wanted to draw a line in the sand and measure from there,” Heather explained of the company’s desire to track its inbound marketing efforts moving forward. Talk of using growth-driven design had already been discussed in passing between Heather and the CEO, so Heather took the website redesign opportunity to ensure it was implemented. The timing was perfect for Data Masons’ website master plan, Heather noted. Data Masons was launching a new version of a product it wanted to showcase, and the biggest show of the year was just around the corner, the Microsoft Dynamics Industry Summit. The time was ripe to launch a new site featuring an improved user experience as well as a look and feel as sleek and modern as the products Data Masons had been delivering for years. The redesign process more or less rolled out in the five weeks as planned, with the only hiccup being Heather’s underestimation of the number of web pages that she had volunteered to update. 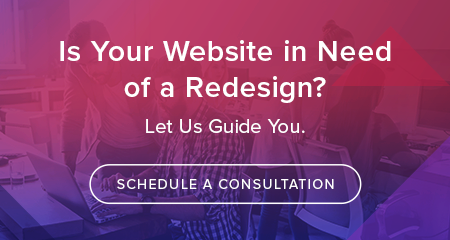 One of the reasons Heather chose LytonWeb was for its attention to even smaller company’s every need, and one of Data Masons’ needs was to keep costs lower by performing some of the redesign work in-house when possible. LyntonWeb was allocated 30 web pages to revamp, leaving the remaining pages for Heather to complete, per her request, using HubSpot templates. What she didn’t realize, however, was the remaining cache totaled about 140 different web pages. Staying on budget and working with a small marketing team of two are among Heather’s challenges, yet she knew HubSpot and LyntonWeb could help in both areas. HubSpot’s intuitive platform lets users set up, add, remove and edit site elements rapidly and easily. And LyntonWeb would be on the scene for help with website redesign – and more. Data Masons new website gives visitors a clean, crisp experience from the get-go. 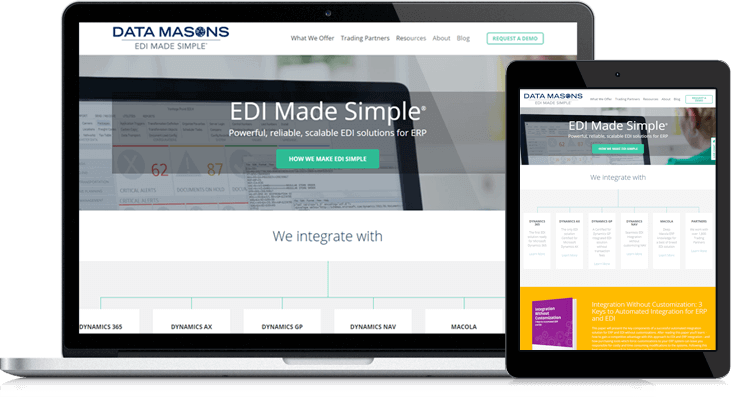 The revamped home page serves as a befitting intro to the rest of the streamlined site, immediately answering questions about how Data Masons makes EDI simple – before they even need to ask. No-nonsense menu choices let visitors quickly select specific topics about which they want to learn more, while on-page forms and buttons let them choose to download resources or schedule a demo or phone chat to learn even more still. Research into the most effective customer optimization systems (COS) led Heather directly to HubSpot. Experience in her previous marketing position taught her she’d receive high-quality, reasonably priced services from LyntonWeb. Data Masons’ new website is poised to bring results while conquering yet one more challenge faced by the EDI solutions provider. Because EDI is a small industry and installment of solutions an in-depth process companies either need or don’t need, Data Masons aims to get access to and in front of quality prospects. The website is now equipped to do just that, with HubSpot, LyntonWeb and the site’s growth-driven design all ready for continuous improvement and relentless forward motion.